Altered Reality Entertainment, owners of Rhode Island Comic Con, the Biggest Show in the Smallest State, celebrates the return of Terror Con with a Halloween Reunion. Terror Con, which returns to the Rhode Island Convention Center after a two-season hiatus, welcomesMalcom McDowell, Tyler Mane, and Scout Taylor-Compton in celebration of the 10th anniversary of the 2007 remake of the original movie by Rob Zombie. Throughout a career spanning over fifty years, McDowell is perhaps best known for the controversial roles of Alex DeLarge in Stanley Kubrick’s A Clockwork Orange, the title character in Tinto Brass’ Caligula, and Mick Travis in Lindsay Anderson’s trilogy of if…., O Lucky Man! and Britannia Hospital. He is also known for his work in Cat People, Tank Girl, and The Artist. McDowell has had recurring roles in numerous television series such as Entourage, Heroes, and The Mentalist. Tyler Mane is a former professional wrestler. As an actor, he is known for playing Sabretooth in X-Men and X-Men: The Official Game, Ajax in Troy, as well as Michael Myers in the remake of Halloween and its sequel, Halloween II. Scout Taylor-Compton has appeared in numerous television roles and feature films. In addition to her role as Laurie Strode in Halloween, her most notable role includes her role as Lita Ford in the film The Runaways. Halloween is an American horror movie franchise that predominately focuses on the fictional character of Michael Myers who was committed to a sanitarium as a child for the murder of his older sister, Judith Myers. Fifteen years later, he escapes to stalk and kill the people of Haddonfield, Illinois while being chased by his former psychiatrist Dr. Sam Loomis. Michael’s killings occur on the holiday of Halloween, on which all the films primarily take place. Terror Con, celebrating horror, paranormal, music, and wrestling, comes to the Rhode Island Convention Center on February 25th and 26th. Tickets are currently available through the event’s website, www.theterrorcon.com. Ticket prices range from $25 to $45. VIP packages are available for $99.99. 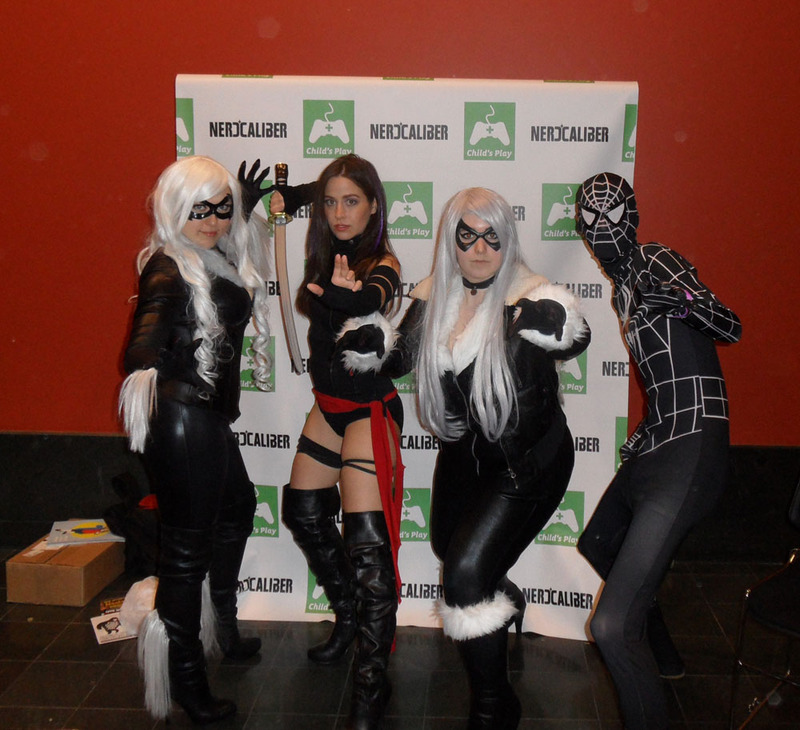 Altered Reality Entertainment and Rhode Island Comic Con have announced this week a new division to their ever-growing presence in the comic book and entertainment industry, Altered Reality Entertainment Comics. Altered Reality Entertainment Comics will release THE RHODE WARRIOR #1 on November 11 at the fifth anniversary Rhode Island Comic Con. In Issue #1, a vile new menace has brought his evil plans to Providence, which threatens the safety of the entire city and all its citizens! Local authorities have only one person to turn to—The Rhode Warrior. In a world filled with super-powered beings and villains of all types, she is Rhode Island’s new defender. 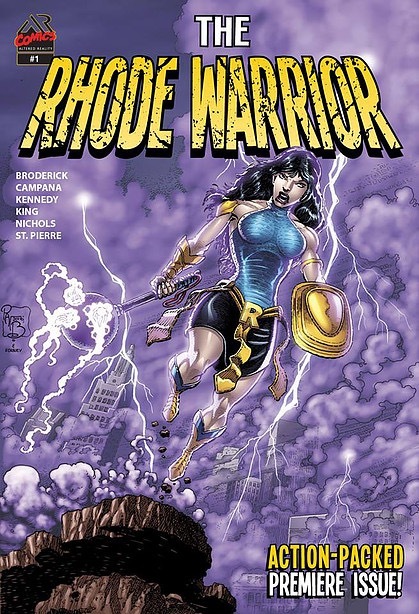 The Rhode Warrior’s adventures are all-ages superhero stories which take place in Providence and the surrounding areas. The Rhode Warrior is a tough character with a strong sense of right and wrong. She is meant to embody the personality, strength, and resilience of the people of Rhode Island & New England. “Steve (Perry) and the rest of Altered Reality Entertainment have given us an opportunity, and we are doing everything we can to deliver something new and exciting to the fans attending Rhode Island Comic Con. The Rhode Warrior has work by phenomenal creators that I grew up reading. Seeing them bring a superhero to Rhode Island is really something else,” commented the book’s co-creator, Ian Chase Nichols. The Rhode Warrior #1 will be available exclusively at Rhode Island Comic Con, November 11 to 13 at the Rhode Island Convention Center and Dunkin Donuts Center arena. Copies of the premiere issue may also be pre-ordered through the convention’s website, http://www.ricomiccon.com. Tickets to Rhode Island Comic Con are still available through their website, The Dunkin Donuts Center Box Office, and all Toy Vault locations. Ian Chase Nichols has worked on multiple Teenage Mutant Ninja Turtles series for IDW, Imaginary Drugs (IDW), The Tick (NEC) and numerous other independent comics, books, and newspapers. He is also a graphic and web designer. He has been the lead designer for numerous award-winning books. Altered Reality Entertainment, LLC is an event entertainment company based in New England. 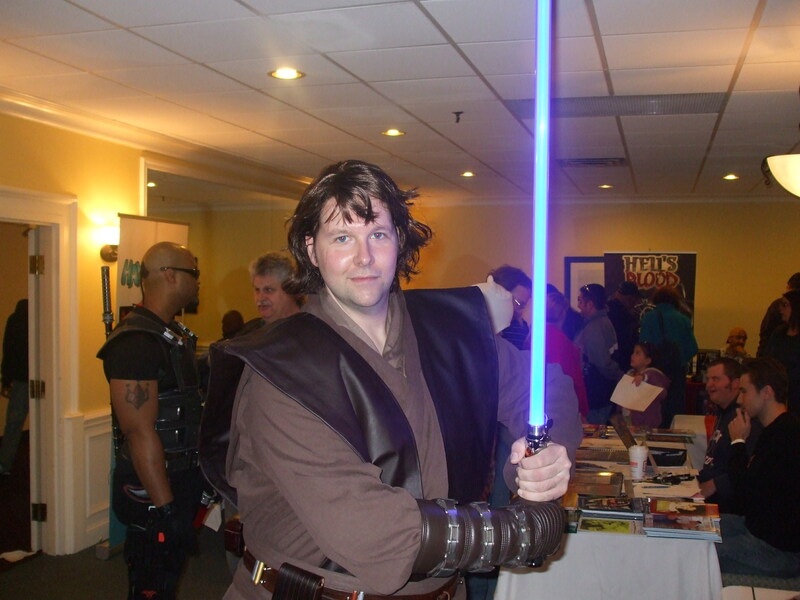 It currently produces multimedia, multi-genre events in the New England area including Rhode Island Comic Con, Terror Con, and Southcoast Toy and Comic Show. In 2016, Altered Reality Entertainment expanded its footprint to include Hartford ComiCONN and Colorado Springs Comic Con. Comic book publishing is its newest venture. Coinciding with the release of Captain America: Civil War, Rhode Island Comic Con, the Biggest Show in the Smallest State, for their 5th year anniversary has announced its latest guest — Anthony Mackie. 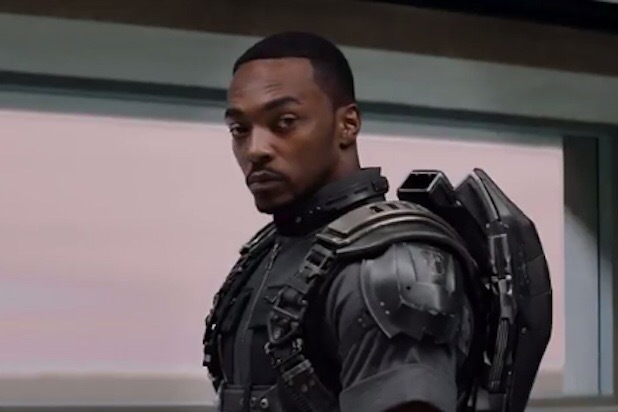 Mackie is best known for his role as the Falcon in Captain America: Winter Soldier, Avengers: Age of Ultron, and Ant-Man, however he has also been featured in recent films such as The Night Before, Love the Coopers, Playing It Cool, and Triple Nine. Mackie will be greeting fans, and offering photo and autograph opportunities. Rhode Island Comic Con is held at the Rhode Island Convention Center and the Dunkin Donuts Center. Available through Ticketmaster and the Dunkin Donuts Center Box Office, Rhode Island Comic Con ticket prices are as follows: a 3-day pass to the show running November 11th through the 13th is $75 for adults and $30 for kids between the ages of 6 and 12. Daily admission is also available, as well as a VIP admission for $139. Attendees are strongly encouraged to buy their tickets in advance. For more information, visit the event’s website at www.ricomiccon.com. Altered Reality Entertainment, LLC is an event entertainment company based in New England. 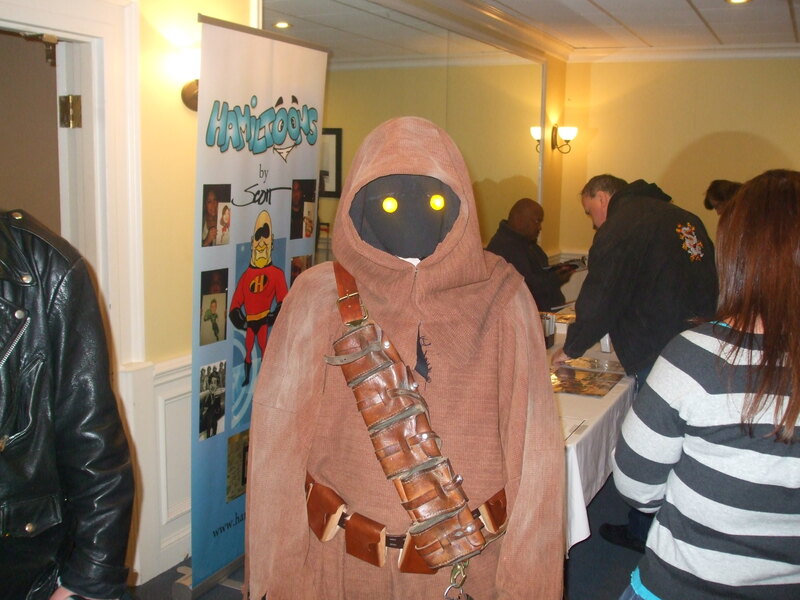 It currently produces multimedia, multi-genre events in the New England area including Rhode Island Comic Con, Terror Con, and Southcoast Toy and Comic Show. In 2016, Altered Reality Entertainment expands its footprint to include Hartford ComiCONN and Colorado Springs Comic Con. Celebrating its fifth anniversary as Rhode Island’s Biggest Show in the Smallest State, Rhode Island Comic Con 2016 tickets officially go on sale today. Available through Ticketmaster and the Dunkin Donuts Center Box Office, ticket prices are as follows: a 3-day pass to the show running November 11 through 13 is $75 for adults and $30 for kids between the ages of 6 and 12. Daily admission is $30 for Friday, $45 for Saturday, and $40 for Sunday. Daily admission for kids is also available, as well as a VIP admission for $139. Attendees are strongly encouraged to buy their tickets in advance. Rhode Island Comic Con is held at the Rhode Island Convention Center and the Dunkin Donuts Center. Preliminary guests announced include Kristin Bauer from Once Upon a Time and True Blood, and comic book artist legends Kevin Eastman and Neal Adams. More guests are slated to be announced as the year progresses. For more information, visit the event’s website at www.ricomiccon.com. New England is getting its second horror convention, TerrorCon, with the first one being Rock & Shock, which will be holding its eleventh convention this October. TerrorCon, which takes place in Rhode Island in June, isn’t the only new horror convention debuting in New England this year. Connecticut Horrorfest debuts in August. TerrorCon is the brainchild of Steven Perry, director of operations for Altered Reality, who has brought conventions to fans of comics, movies, and pop culture. 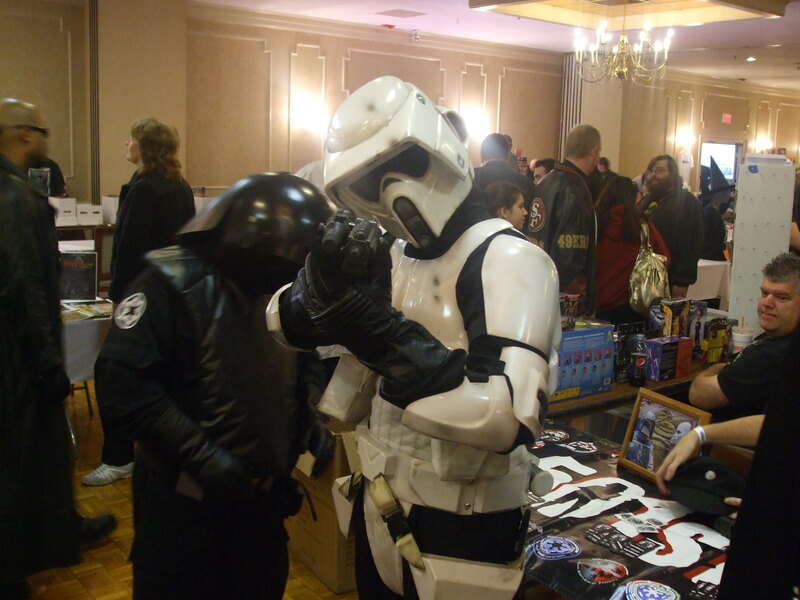 These conventions are Southcoast Toy and Comic Show and Rhode Island Comic Con. Perry had been thinking of his newest one, TerrorCon, for about a year, he said. Perry thinks the organizers of Rock & Shock do a great job so he decided to have his new convention take place in June so as not to interfere with Rock & Shock. He didn’t want to step on anyones toes, he said. Perry isn’t sticking to only New England to organize shows. His company is in the process of organizing shows for New Jersey and Colorado, which should be starting up in 2015, he said. He can’t say what those shows will be since they are not fully developed, which is the reason he hasn’t announced them yet. If you couldn’t guess from the different line-ups for Perry’s shows, they always try to do a theme, he said. They plan their guests around whatever theme they decide to do. Whatever guests they choose and book for the event, they are sure to tell the fans about who is coming. They have lists of guests for the next two years, he said. “We like to keep the fans enticed and let them know what’s going on all the time. Something new pops up with us, we put it up for everybody to know,” Perry said about constantly updating the convention websites. Here is just some of the guests coming to TerrorCon: David Giuntoli (Grimm), Linda Blair (The Exorcist), Michael Biehn (The Terminator, Planet Terror), Dee Snider (Twisted Sister, The Celebrity Apprentice), Lita Ford, Cherie Currie, Michael Jai-Whie (Spawn, Arrow, Fast and the Furious 7, The Dark Knight), Nicholas Brendon (Buffy the Vampire Slayer, Criminal Minds), Josh Stewart (Grimm, Criminal Minds, The Dark Knight Rises), Kane Hodder (Friday the 13th: Part 7, 8 and 10, Hatchet), Lew Temple (The Walking Dead) and Dee Wallace (ET, The Howling). Perry started organizing conventions with the Southcoast Toy and Comic Show, which was held in a VFW hall, seven years ago. That first show had about 300 people in attendance, he said. It’s a far cry from the 22,000 people who attended the first Rhode Island Comic Con when they thought the attendance would be around 10,000 and the 30,000 people they had for the second Rhode Island Comic Con. He’s expecting between 10,000 and 15,000 people to attend TerrorCon, which is a safe number in the mind of Perry. “The horror market is a little more of a niche market so we don’t expect a large audience,” Perry said. His vision for Southcoast was t bring a reasonable size show that would be community based, Perry said. He wanted something for the fans in that area to be able to look forward to every season or twice a year. Another thing he wanted to do was bring in celebrities that people don’t always have a chance to meet, he said. Perry said that TerrorCon will be the same size of the original Rhode Island Comic Con plus an extra ballroom. TerrorCon takes place June 7 and 8 at the Rhode Island Convention Center in Providence, RI. 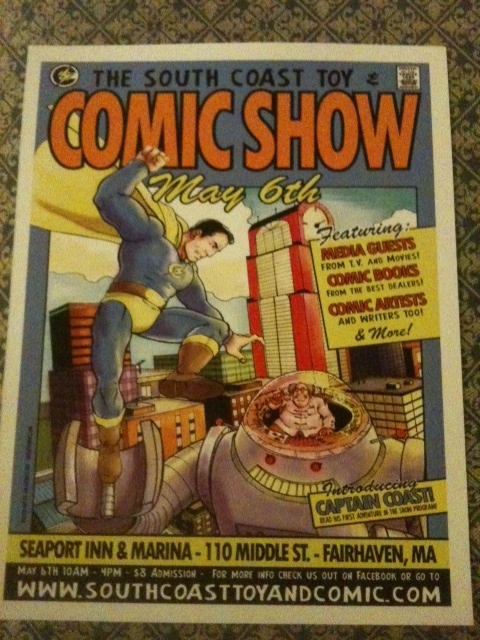 Author Rob Watts will have a table at the Southcoast Toy and Comic Show this Sunday, May 19. The convention runs from 10 a.m. to 5 p.m.
Watts will be selling and signing copies of Huldufolk and Crabapples. Each book comes with a CD of music that he personally created for each book. Don’t be afraid to ask him about his books or the craft of writing. 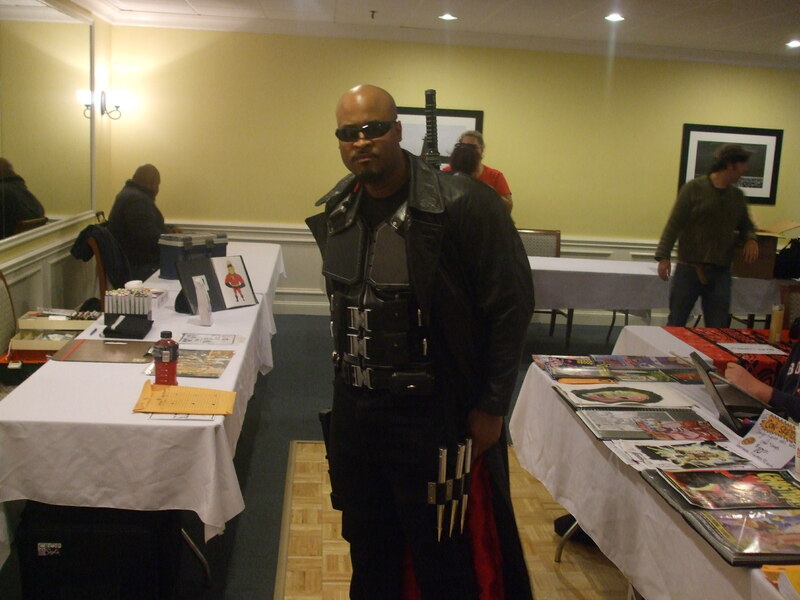 This is his second time at the Southcoast Toy and Comic Show. 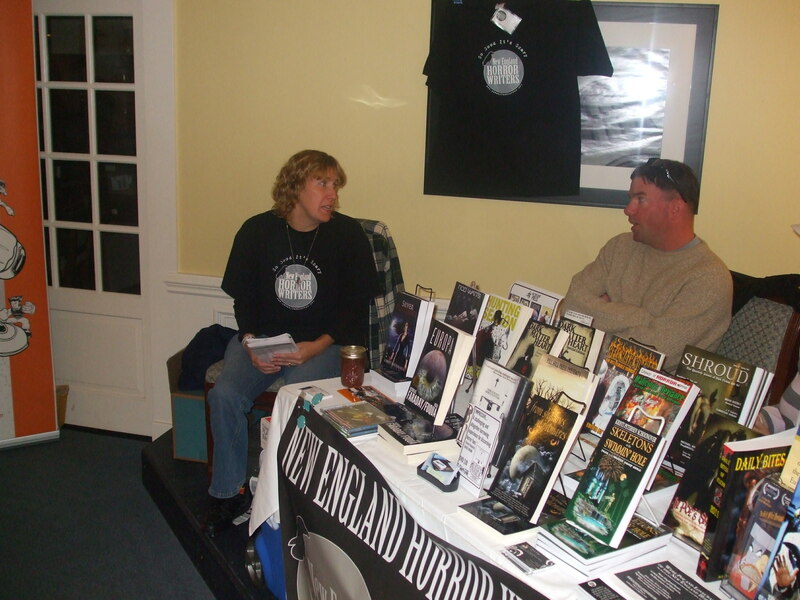 The last time he was there was back in 2011 with the New England Horror Writers organization. The convention takes place at the Seaport Inn and Marina, located at 110 Middle Street in Fairhaven, MA. For more information about the convention, click here. 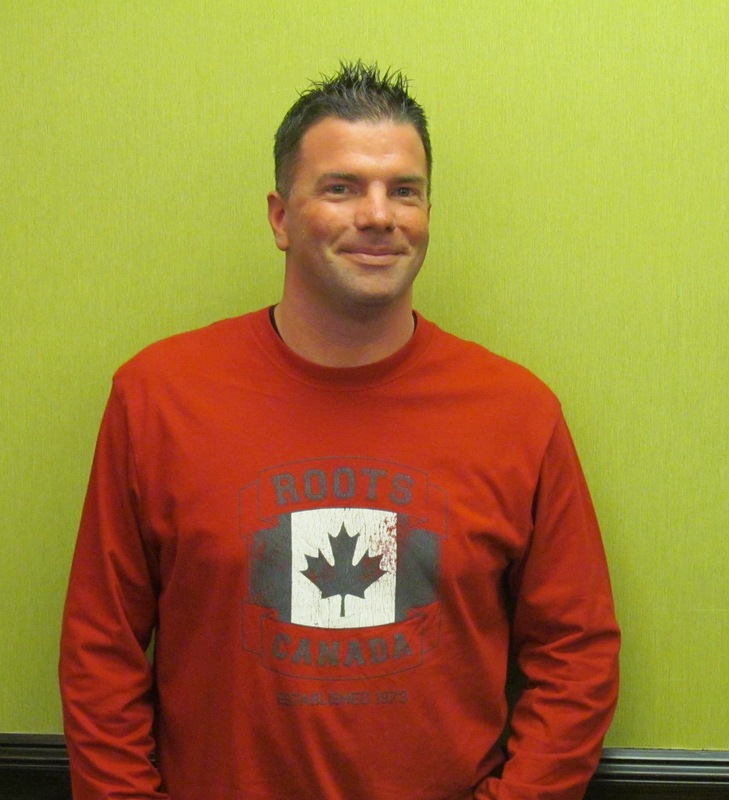 For more information about Watts, visit his website by clicking here. 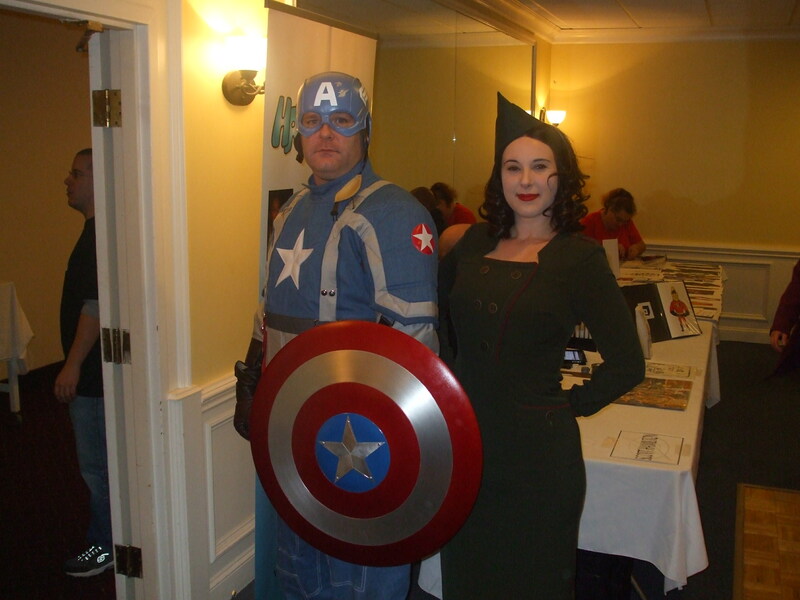 Check out this article that includes a write-up and pictures from the 2011 Southcoast Toy and Comic Show. You can find the article here. I am a well-educated, fairly dignified woman. I read Faulkner and Hemingway and have studied the morphological and chemical variations of the common dandelion. And, as anyone who has ever been to a convention with me can tell you, I totally geek out when it comes to meeting former wrestlers. At Rhode Island ComicCon, I had the pleasure of meeting Jake “The Snake” Roberts and “Hacksaw” Jim Duggan. For those of you who don’t know who these men are, you’ve probably already given up on this article anyway, so I don’t feel I need to explain. Wrestling superstar Jake “The Snake” Roberts stated in casual conversation that he’s feeling great, is drug free, and recently lost 40 lbs. He’s an advocate of DDP Yoga (www.ddpyoga.com) and highly recommends the workout and meal portions that the program teaches. He was animated and enthusiastic when talking, and it was wonderful to see Roberts looking and feeling well. Hacksaw Jim Duggan handles the wrestling panel himself. Photo by Jason Harris. 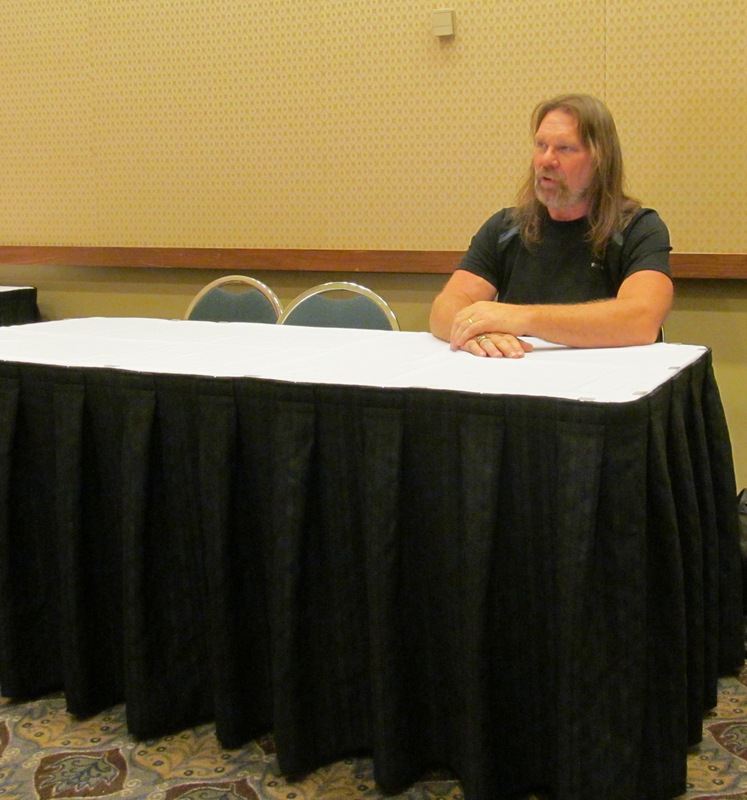 The wrestling panel that was scheduled for Sunday afternoon turned in to a Q & A session with WWE Hall of Famer “Hacksaw” Jim Duggan. (Originally, the panel was to include Roberts and wrestler Big Van Vader, but Roberts had to leave early to catch a flight, and Vader was a no-show.) Duggan has been wrestling for 33 years, and his love of the business was evident in his enthusiasm and the beaming smile he wore while talking about his career. He was friendly and articulate, occasionally breaking out into his Hacksaw persona to emphasize a point. Duggan patiently answered questions about his former employers (both the WWE, which Duggan states “is run like a corporation, which it should be, because it is one” and the WCW, which he recalled as “the inmates running the asylum.”) He spoke about former coworkers Andre the Giant (“he was a lonely man”) and Hulk Hogan (“he’s a real good guy”) with fondness. As with any employee at a company, he didn’t always get along with the people he worked with, but was a gentleman when former opponents he didn’t care for came up. “We aren’t close,” he would explain if someone asked him about a specific wrestler he didn’t get along with, and would deftly move on to the next question. Duggan’s achievements in the ring include winning the first (then-WWF) Royal Rumble in 1988 and WCW Television Champion and United States Heavyweight Champion. He named his 2011 WWE Hall of Fame induction as one of his proudest achievements. When asked about the 1997 “Montreal Screw Job” (in which WWE Champion Bret Hart was asked to drop the belt to Shawn Michaels prior to Hart’s exit to WCW, which Hart refused to do; WWE owner Vince McMahon called for the bell early even though Hart hadn’t submitted, ending the match) Duggan surprised the audience. “I actually think Bret was wrong,” he admitted. “If the boss tells you to drop the belt, you drop the belt.” Hart hadn’t wanted to lose in Canada, his home country. “I don’t want to lose in America,” Duggan laughed. “But you do it because the boss tells you to.” Duggan and Hart have spoken about the incident and remain friends. Duggan is also close to “Rowdy” Roddy Piper and Hogan. 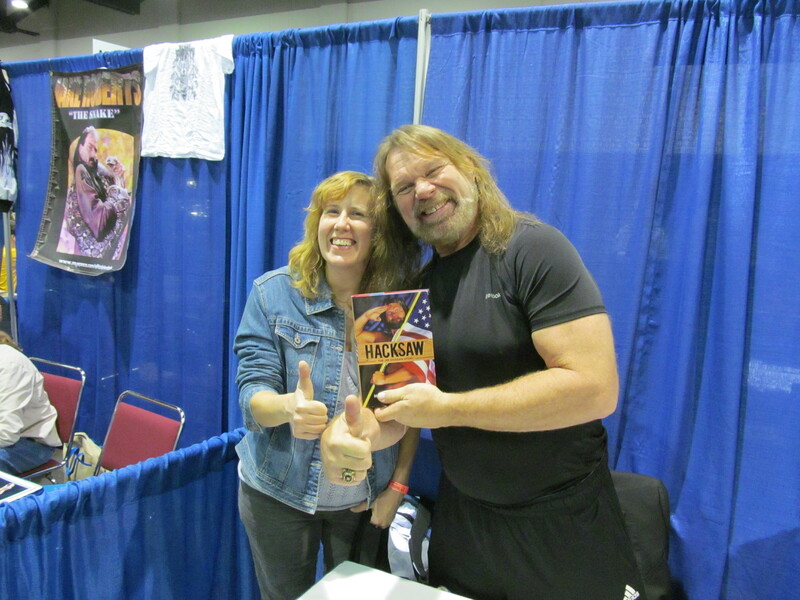 Author Stacey Longo geeking out with Hacksaw at the Rhode Island Comic Con. Photo by Jason Harris. Duggan ended the hour-long session by allowing fans to get their picture taken with him, a big-hearted gesture considering other celebrities were getting $10 to $20 on the convention floor for photos. Meeting both Roberts and Duggan was a thrill for this particular wrestling nerd, and the highlight of my weekend. Side note: I was able to meet Big Van Vader briefly at this event as well. We aren’t close. Quick introduction: I’m Rick Silva. I’m a relatively new member of the NEHW, but I’ve been involved in the local convention scene for quite a number of years. These days, most of the conventions I attend are in my capacity as a small press comic book publisher, although I’ve been fortunate enough to have had a couple of prose stories published in the last year or two, and have done panels and readings in that capacity as well. 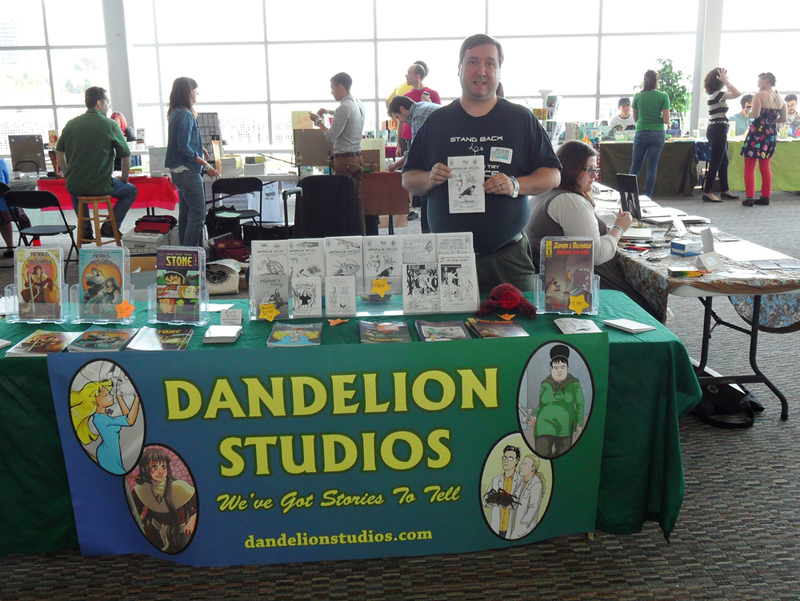 For Boston Comic Con, my Dandelion Studios comics were sharing a table with Joe McGlone of Fallenmage Productions and his comics. We drove in early Saturday morning, and were shown right to our table by the very well-organized convention staff. The show was held in one of the main exhibit halls of the Hynes Convention Center in Boston. We parked at the Prudential garage both days, which was pricey. I’d originally thought we could get around some of that cost by validation deals, or by moving the car to the street for part of the show, but those options proved to be too much of a hassle and we ended up paying full price both days. I think I will go back to taking the subway in (which I did for Anime Boston) if I attend this show again. The show itself was lively and well-attended. There were some incredible cosplayers making the rounds. Star Trek, Star Wars, and Ghostbusters fan groups were set-up where the fans entered and the hallway was crowded with people taking pictures. 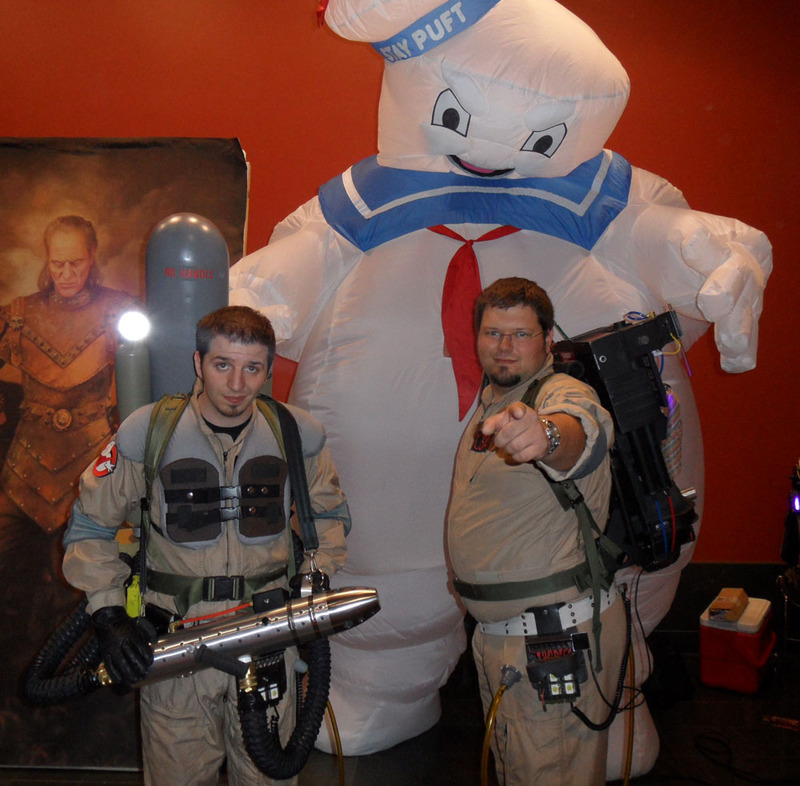 The Ghostbuster guys even had a giant inflatable Stay-Pufft Marshmallow Man. We had a steady stream of people stopping by our table, and just about all the local small press comic creators I know were present at the show, so I caught up with a lot of friends, and bought some new comics and mini-comics in between selling my own books. Joe was thrilled to get a stack of book autographed by iconic horror artist Bernie Wrightson, and I bought a copy of Womanthology as a birthday present for my wife and got it signed and sketched in by eight of the contributing artists. Boston Comic Con has been growing every year. I didn’t get too much time away from my table, but the guest list was really incredible this year, and the fans seemed to be having a great time shopping and meeting an impressive guest lists of great comic artists. The Maine Comics Arts Festival is one of my absolute favorite shows for a bunch of reasons. First of all, it’s all small-press creators. As much as I love buying older collectible comics, there is something really amazing about a show made up entirely by comic creators and their labors of love. Organizers Casablanca Comics does a great job of getting the word out, and the show is always well-attended, and a lot of the audience are families discovering small press comics for the first time. It also helps that the price of admission is only $5. Then there’s the setting. The venue is the Ocean Gateway terminal in Portland, a cruise ship facility that sticks out into Portland harbor. Forget about dimly-lit rooms or cavernous conventions halls. This place has huge windows all the way around and a spectacular view of the harbor. It’s also in walking distance of restaurants, and for our son, the Maine Narrow Gauge Railroad Museum. 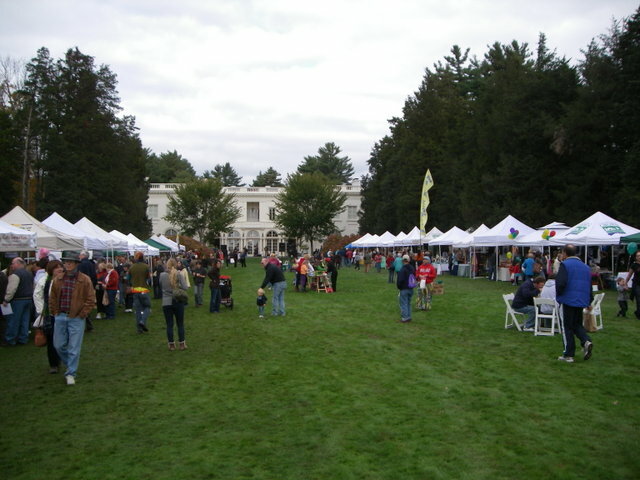 The Maine Comics Arts Festival was the first convention our son attended, at age 2. This year was his third time at the show. He’s old enough to have some input into the plans, and what he wants is a train ride! Portland is a little over three hours from Cape Cod, so we got on the road around 6 a.m. To make things a bit more challenging, I’d pulled an all-nighter scrambling to put together the newest issue of our mini-comic series Unpopular Species (a science/nature comic about creatures that are, well, less loved). Gynn did much of the driving while I got some much-needed sleep on the way up to Portland. Fortunately, even Boston is quiet traffic-wise early on a Sunday morning, and the trip went smoothly. We spent the day taking turns selling comics and taking the Kiddo on train rides. Turns out you can ride all day for one price. Kiddo was thrilled. Unpopular Species was a big hit, and we had a really good show in general. The ride home was exhausting, but we got back without incident. This was the finale to a whole series of Spring conventions we’d done appearances at for the comics. Starting with Conbust at Smith College, we were at Anime Boston, Boston Comic Con, the Rochester New Hampshire Free Comic Book Day festival, the Southcoast Toy and Comic Show, and finally the Maine Comics Arts Festival. Now, we get a couple months break before a major road trip at the end of July to Baltimore for Otakon. See you out on the road! As writers, we primarily function independently, quietly, and quite frankly, in our own worlds while working. Even when typing away on our laptops in a crowded Starbucks, we see no one and hear no one. We like it better that way. Occasionally, we share our pages with trusted friends or significant others, and if we’re really lucky, a writer’s group. However, the bulk of our work is done in our head, which makes for a great product but a poor connection with our audience. Audiences are anything but static. Their tastes, desires, and habits change as quickly as literary trends. The readers we had in mind three years ago for book one of a series may have completely different expectations for our genre by the time we begin plotting out book four. Following trends made by the publishing companies won’t give us the insight we need. Many readers are disgusted by what the publishing companies continue to stubbornly feed the public. We, as writers, need to actually connect with our potential readers to understand them better. After all, without readers, our books are merely attractive decoration for the bookshelf. We write for them. So, how do we get away from our keyboards and actually meet the people for whom we write our stories? In a world where bookstores are closing and Kindles are gaining in popularity, most sales transactions are done electronically, and writers are even further removed from readers than before. 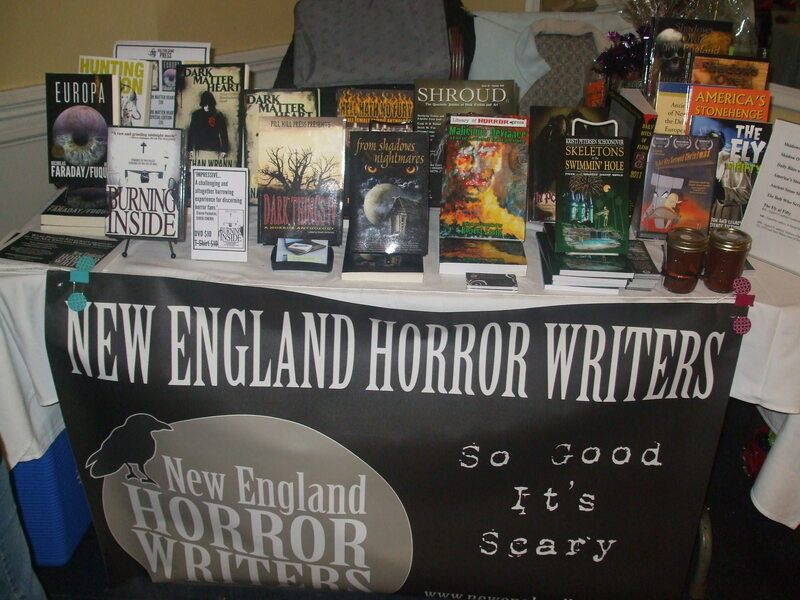 So, when the New England Horror Writers participates in events that put writers in front of potential readers, it makes for a great opportunity to bridge that ever-widening gap. As a new member, I really didn’t know what to expect. And, honestly, after participating in two public events thus far, I still don’t know what future ones would hold. Because my novel is a genre crosser, ranging from urban fantasy to paranormal fiction, I was thrilled to be at the Southcoast Toy and Comic Book show in Massachusetts. As someone who used to frequent these types of events many years ago, I felt I, along with everyone else at the table, was smack in the middle of my target audience. Without dwelling too long on unmet expectations, I will say that we were honestly surprised by the general lack of interest from those present. Sales were made, but people for the most part, seemed nonplussed by our presence. However, getting out there as a writer isn’t always about making books sales. Sometimes, it’s about making contacts. A man whose group does book reviews and features science fiction and fantasy books on his weekly podcasts approached our table. As each of us smiled and optimistically took his business card, I’m sure we silently thought that this one contact was worth the two-hour drive. I know I did, and thus far following up with that one contact has been rather positive. 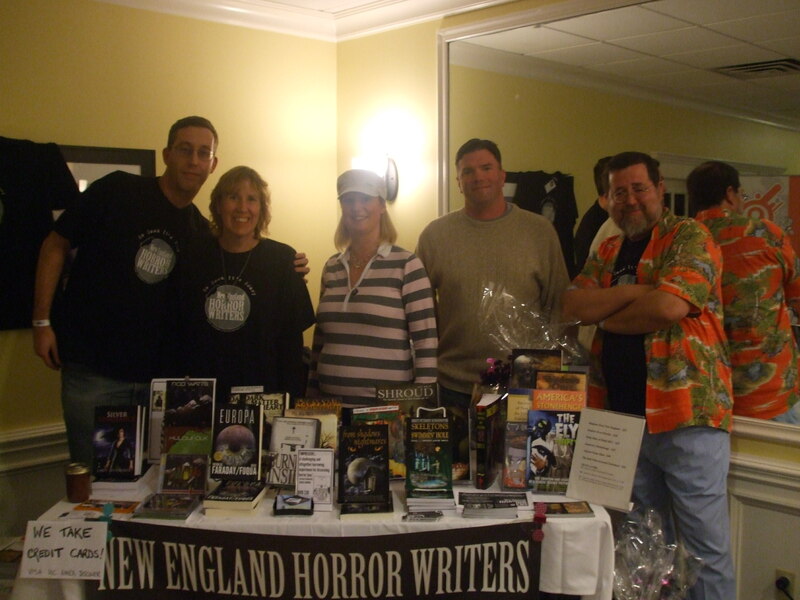 Two weeks prior to that event, the New England Horror Writers participated in the Wadsworth Open Air Market in Connecticut. Expectations were far surpassed at this event. Many sales were made, and most of us spent the entire afternoon talking to people about books, writing, and the horror genre. Even people who said that horror was not for them seemed pleased to see us and were eager for conversation. We felt enthusiastic and pleasantly surprised by our experience afterwards. Therefore, while both of the events provided drastically different results, the writers who participated gained something from the experience whether it was multiple books sales or a meaningful contact. However, the most important aspect of these events is that it forces us writers to pull ourselves away from the blue-white glow of our computers and talk to our potential audience. We simply don’t get that chance often enough. And, we’re better writers for it. My only expectation from these events is that anything could happen. 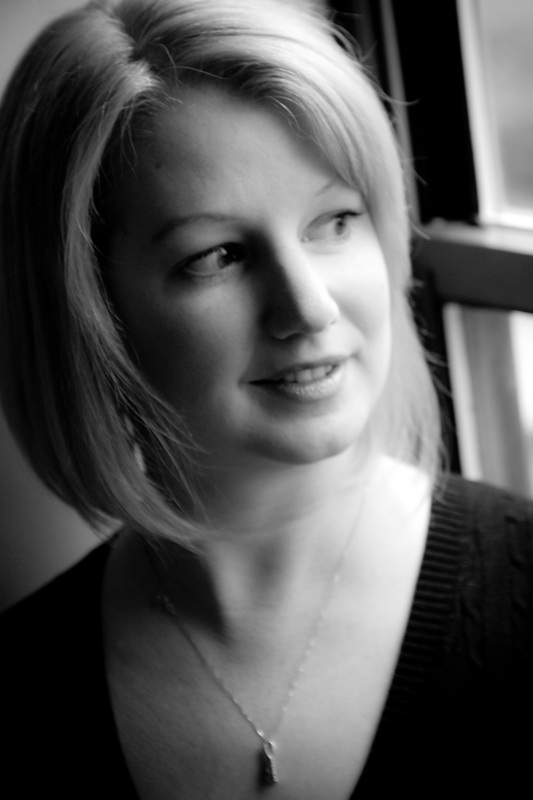 We could meet someone who says, “I do book reviews and feature writers on my weekly podcasts. Here’s my card.” Or we could have a fifteen minute conversation with someone who asks, “So, why the horror genre?” We may sell all the books we brought. We may give out postcards and business cards to prospective readers, or we may get a hand cramp from autographing copies of our books. However, I do know that we’ll be outside the writer bubble, the vacuum that can sometimes consume us. And, that opportunity in and of itself is worth it. There was no sleeping in this morning. No enjoying the extra hour of sleep gained from falling back a hour for Daylight Savings Time. The day started at 5 a.m. Sunday morning for Author Stacey Longo and myself. 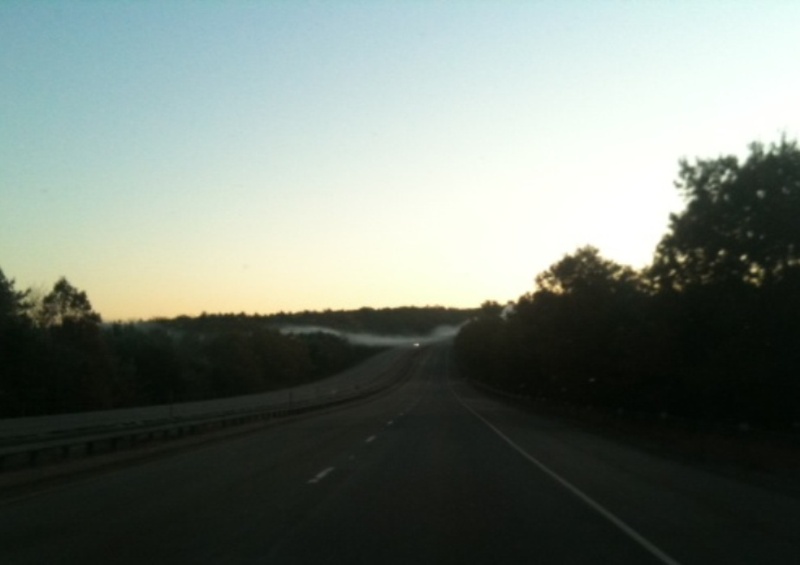 We left around 5:40 to get the SouthCoast Toy and Comic Show in Fairhaven, MA. On our drive to the show, we came across this site. We arrived at the Seaport Inn and Marina without any problem. Once there, Longo performed her magic and had the table set-up in no time. This picture is of the second version of the NEHW table. There were two more set-ups as different authors arrived. Thanks to Longo, Dave Goudsward, Kasey Shoemaker, and Rob Watts for participating in today’s event. Thanks goes out to Nathan Wrann and Kristi Petersen Schoonover for having their books and dvds at the table. 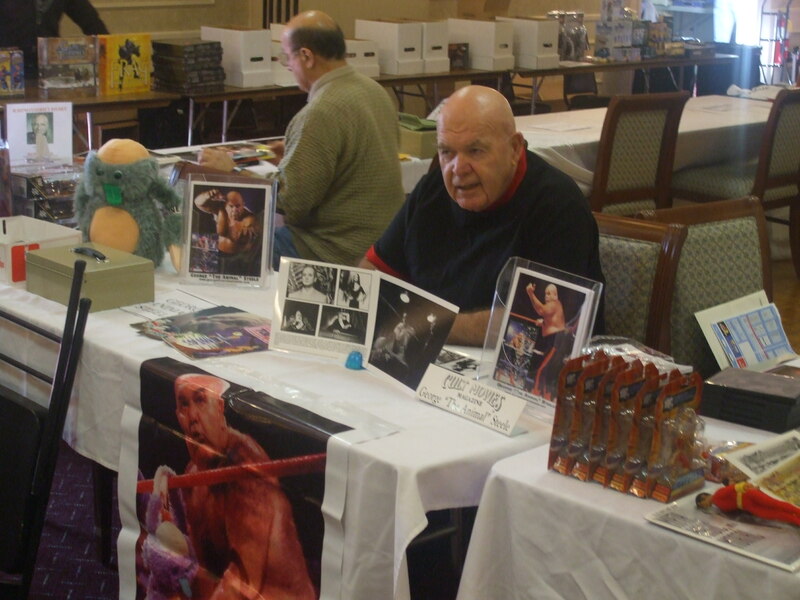 The Toy and Comic show had many draws today from George “The Animal” Steele, Brian Harnois, Penny Dreadful and Gaoru, Uncle Fright, and Thom Christopher (Hawk on Buck Rogers). 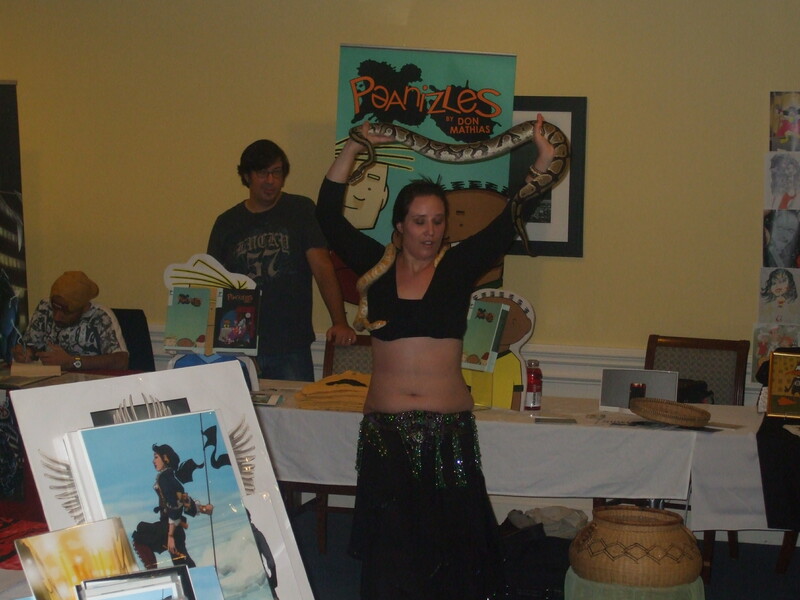 There were also sideshow performers and paranormal researchers. 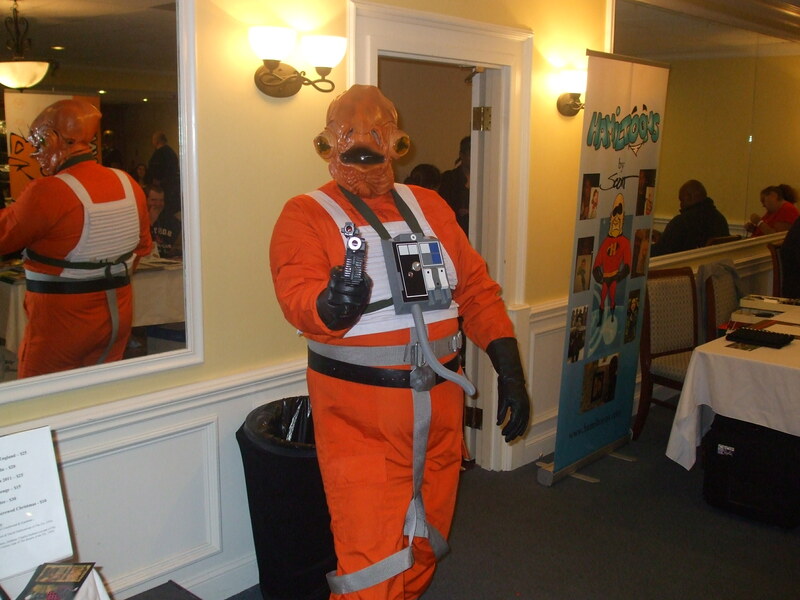 Along with the stars and guests to see and meet, there were also convention attendees who came in costume. Books were sold and some great networking opportunities were made. The show was a lot of fun and I know the NEHW will be back at this show in the future. It was nice meeting Rick Silva of Dandelion Studios today. He will have a table at Anthocon next weekend. Watts, Longo, and Goudsward will be attending Anthocon next weekend in Portsmouth, New Hampshire. Be sure to look for their books at the NEHW table at the convention. 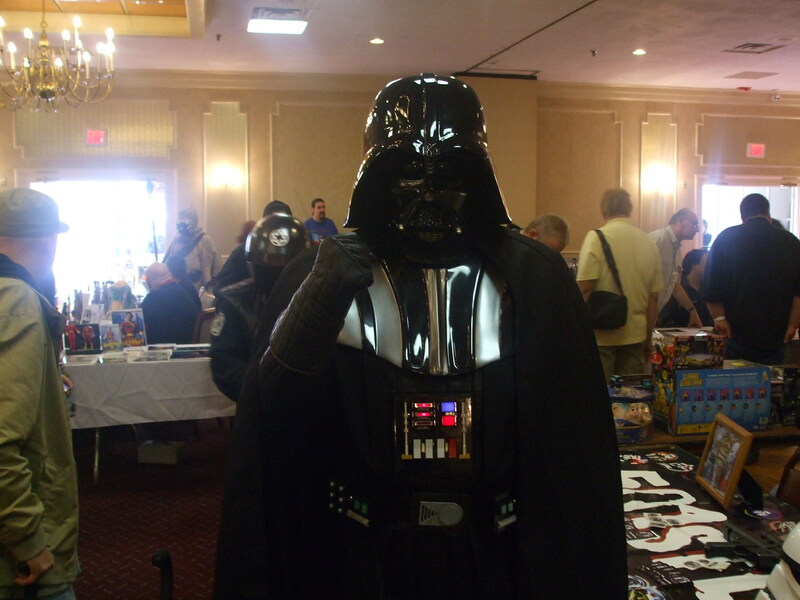 Enjoy the following pictures from the SouthCoast Toy and Comic Show. Eric Shafer, of Waltham, MA. 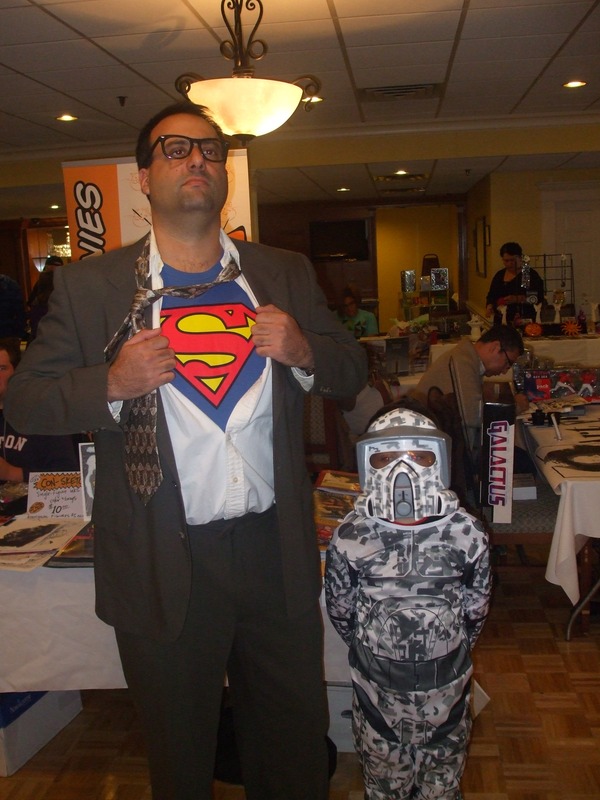 Mark Tauares as Superman and his son, Myles, as a stormtrooper.